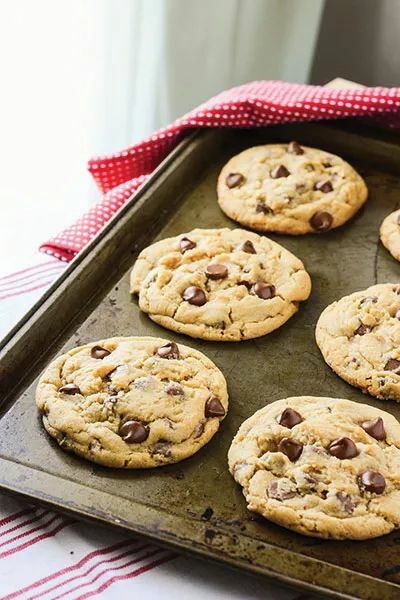 The world's perfect chocolate chip cookie recipe. 12 oz Ghiradelli milk chocolate chips or other quality chocolate chips, 11.5 . Mix until just combined. Do not overmix. It's best to make bigger cookies for the right texture - so I would recommend using a 4 Tablespoon size scoop to form your cookies. Place on cookie sheet and bake for 15-17 minutes. I like mine to look a little undercooked in the middle, then let them finish cooking on the cookie sheet for a few minutes while they cool. Then move them to a cookie rack or plate to keep cooling. If you are freezing these cookies: Form into balls, and freeze on a cookie sheet. After frozen remove and add to a Ziploc freezer bag. They will last for about a month in the freezer. To bake just take out and bake as directed, adding a few extra minutes of baking time.